My friends from Napoli Underground (NUg) seem to be doing a lot of poking around above ground these days. I suppose they can always claim that the mountain treks they take into the rugged areas in south-central Italy are to search out the many karst caves, the most notable features of which are stalagmites and stalactites, so in a way they really are prowling around “underground.” Whatever the case, the mountains about 80 km (50 miles) north of Naples and inland, smack in the middle of the peninsula, are called the Matese mountains or massif; they are part of the central-southern Apennines, the “backbone of Italy." Administratively, the Matese mountains are in the Molise region, the next region to the north of Campania. It's a pleasant drive from Naples. 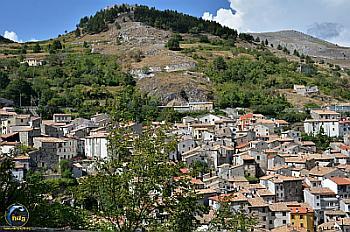 Roccamandolfi is a town in the Matese mountains about 15 km (9 miles) southeast of Isernia. It sits at 850 meters (c.2600 feet) above sea level and is quite near the highest point (2050 meters/6150 feet) of the massif, Mt. Miletto. The town has a population of just over one thousand, down from about 3500 in the year 1900, before the great waves of emigration struck many parts of Italy. It is about 5 km (3 miles), as the crow flies, from Roccamandolfi to Campitello Matese, the path my friends intended to follow. In these hills, the crows have it easy. To explain the title of this entry. In 2007, the Molise region presented a memorial bell (image, left) (fused in the Pontifical Marinelli foundry in nearby Agnone) to the town of Monongah in the U.S. state of W. Virginia for the commemoration of the worst mining disaster in U.S. history a century earlier. It occurred on December 6, 1907 in Monongah at the Fairmont Coal Company. No one seems to know the exact death toll, but the official count (certainly too low) was 362. The explosion and fire created 250 widows and 1000 orphans. Molise sent the bell because 87 of the dead were from this very area in Molise, near Roccamandolfi. The emigration numbers break your heart. In 1900, more than 3,000 inhabitants; then the sudden drop as thousands go abroad to seek a better life, many as coal miners. Today the bell sits in the Monongah town square. It tolls for them, and I do not mean that in any flippant or disrespectful sense. I was moved to include this information because I set out to write something maybe a bit light-hearted and found a moving human interest story. Now I know it and so do you. All of the towns in the hills of southern Italy have their own wrenching stories of the Italian diaspora. All of them. 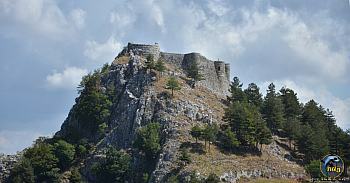 Indeed, my friends set off from Roccamandolfi towards Campitello Matese and found both the Tibetan bridge as well as the ruins of the Longobard castle (image, right). They then got daring and hiked around Monte Crivare along part of the north slope in order to get down to a stream that is a tributary of the Callora river. At that point they got common sense and turned back. They had got down to the riverbed and started running into deep pools that they could not ford with their equipment. They were, indeed, now in the Callora River Nature Preserve, where the going really can get rough —steep walls, deep water, etc. In ancient times, these hills were home to Samnites, mortal enemies of the Romans. The Samnites eventually lost that battle (as did every other people on the Italian peninsula!). The most significant archaeological site after the end of the Roman period is the Longobard castle named during that period (end of the 800s) for one Maginulfo, (a Longobard name if ever there was one!). The castle and domain went through typical transitions from Lombards to Normans and into the long feudal history of southern Italy and finally into the more modern Bourbon history of the south. More recently: Roccamandolfi is only about 55 km (35 miles) from the waters of the Tyrrhenian sea (at Gaeta) and in the hills near Monte Cassino and near the infamous Liri Valley (called “Death Valley” by the Allies in WWII), the main Allied invasion route towards Rome. The town was also near the Gustav Line, one of the deadly German defensive lines strung across Italy. The towns in the area suffered bombardments and visitations from soldiers of various nations as the war moved past them in late '43 and early '44. 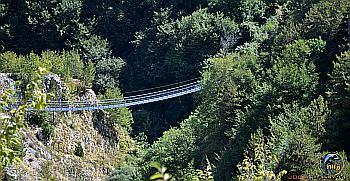 The other target, the Tibetan bridge (image, above), is new and made of steel and looks solid. It is the latest attempt to add some accessibility to the area, connecting, as it does, the mountain slopes on either side of the Callora river in the valley The area is almost deserted even at the height of the tourist season. There are now a few hotels and even chair and ski-lifts; it does snow up there and sometimes quite considerably, but the summers also enjoy very warm temperatures. photos: the bell photo is uncredited; all other photos from Napoli Underground.